Are you having a problem with your process and don’t know where to turn? Or maybe you just want to improve your cycle times. With over fifty years of troubleshooting experience, we have probably solved a problem for someone else that has very similar characteristics to your situation. But since every molding project has its own set of variables, the best solution is to have one of our troubleshooting specialists visit your facility and see your problem first-hand. Once we identify the problem, we will make recommendations on how to correct the situation, improve cycle times and save you money. Our on-site team will come to your facility, bringing a full compliment of state-of-the-art gauging equipment, to perform a comprehensive inspection and analysis of your molding machines. 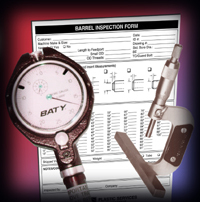 We'll measure your barrels and screws and provide a complete inspection report outlining the current condition, possible wear patterns, and suggestions for repair or replacement, if necessary. Let SFP help to alleviate the guess work, cost and headaches associated with repair or replacement of your screws & barrels. It's as easy as 1... 2 ... 3! Send us your components for a FREE inspection. We'll measure your barrels and screws, provide you with a comprehensive inspection report, and suggest any necessary repairs or replacement. No work will be done without your approval. The best part? It's all free of charge. Does your injection unit provide you with the correct amount of plastic material? If you're not sure, SFP's Engineering Design Team can quickly determine whether Downsizing or Upsizing could save you money. When Downsizing or Upsizing is needed, Services for Plastics, Inc. is able to help by re-designing the injection unit of the molding machine to produce the appropriate amount of output for your specific application. Many molders are entering into new frontiers for their perspective businesses. Molders used to be categorized as either thermoplastic or thermoset molders. With today's changing economy and competitive markets, it is necessary for molders to become more flexible in order to meet the demands of their customers. SFP's Engineering Design Team can help you meet these challenges. Our team of full-time design engineers are experts in both thermoplastic and thermoset injection unit design. Never measure another barrel or screw again! Our on-site measuring team will come to your facility and carefully inspect barrels and screws on your molding machines. Then you will receive a complete detailed inspection report showing any wear patterns and suggestions for repair or replacement, if necessary.